Last week I addressed bread and grain products in general. The reason I began this journey by addressing bread is because we eat entirely too many grains in our western diet. They are a high glycemic food (more on that later), broken down as sugar, and stored as fat. Bread is so “ingrained” in our culture that giving it up completely may be unrealistic. However, if you look at bread as a treat and curtail your habitual bread habits you will be far along in maintaining a healthy weight and fighting inflammation. Remember, your success in this program is directly proportional to the positive changes you make. I hope this past week you have taken a serious and honest look at your bread and grain consumption. Now, this week instead of telling you what not to eat I want you to concentrate on the most important foods you do want to be eating. VEGETABLES! If you simply cut out the bread and grain products and added twice as many vegetables as you now eat you would experience an incredibly healthy change in energy level and weight control. You see, our body is constantly changing; growing hair, replacing dying cells, thinking, speaking, taking in air, expelling poisonous carbon dioxide, eliminating waste, attacking invaders, healing strained tissues, and on and on as it keeps you healthy and alive. It’s all done at the cellular level, and EVERY cell function requires vitamins and minerals to be carried out. 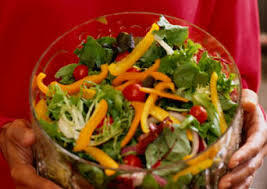 Vegetables are the most abundant food source for the vitamins and minerals that your cells need. Please understand that disease is the END PRODUCT of a process that begins when cells are overly taxed by toxins and non-genetically congruent food. Disease doesn’t just happen. Your body was made to be healthy! How our body functions is nothing short of a miracle. Your cells are constantly trying to clean up the mess that we create for it. But eventually, with repetitive and relentless stress (and poor food is definitely a stress) cells can get to the point where they just can’t take any more and they break down. That is when our body is susceptible to a disease process. You don’t come down with diabetes after drinking one soda. The cells may recover from the stress of that unhealthy sugary drink, but if they are exposed to a constant barrage of sodas and other sugar products then eventually diabetes will occur. Also understand that EVERYTHING you put into your body either nourishes your cells or are is toxic to your cells. No food is neutral. When those poor cells are exposed to a constant onslaught of unhealthy food they must use energy just to neutralize the toxin before getting on with keeping you healthy. No wonder you feel like you have no energy. Your energy is being sapped by damage control. I’ll take the next couple weeks giving you suggestions as to how to get more vegetables into your diet. And I don’t mean just a small “side” vegetable on your plate of more protein, starch, and fat. We’ll begin viewing the salad a little differently than you may be used to.